Constructed in 2003 and birthed from a dream, this magnificent 3500 square foot, Douglas Fir custom hand crafted log home with attached 600 square foot, two-car garage sits on a heavily wooded half acre lot. 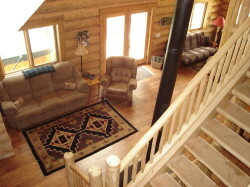 The "cabin" has four bedrooms, three and a half baths with loft, and four decks. Drive up to this amazing home along custom built stone retaining walls that blend with incredible rock work and stone work on the house. The main floor includes the master suite which has it's own private balcony overlooking an aspen grove, a wrought iron gas stove, log bed with cabin themed linens, jacuzzi tub for two, and glass block enclosed shower with large walk-in closet, vanity and double sinks. 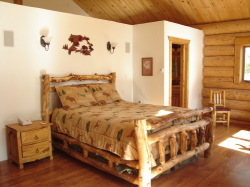 There is a second bedroom with two twin beds, stuffed animals, and is perfect for the little ones. 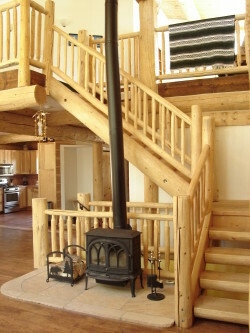 The great room is divided into two areas with a large wood stove, dining room with seating for six to eight at the table, breakfast bar for three, full kitchen with stainless steel appliances, main deck with 7 person hot tub, and an elegant Kokopelli themed half bath. Basement includes wrought iron gas stove, Mexican theme tile & wood bar, rustic entertainment center with flat screen TV, VCR, DVD and surround sound system, large selection of board games, queen sleeper sofa, private bedroom, full bath, and laundry facilities. The loft provides the best views of the Breckenridge Peaks, with library, futon, PC with high speed internet access, bedroom, full bath, and balcony. House is wired with a state of the art sounds system that can be heard throughout the house as well as out on the back deck, and is remote controlled. The Bear Cabin is available for weddings (minister on call), reunions, and other occassions. Please ask for more information. Due to unfortunate circumstances we currently do not accept furry friends. 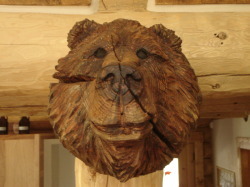 The Bear Cabin is a "No Smoking Zone". PLEASE EMAIL FOR A FULL ALBUM OF PICTURES OF "THE BEAR CABIN"!!! It is our desire to make this vacation home the most welcoming and enjoyable place you've been. We have taken the time to add personal touches so that our home feels like your home. Please contact Melanie or Paul with any questions or inquiries. We look forward to hearing from you!! !